It seems like everyone is getting on the DLP bandwagon in the 3D printing space as of late. While we have known about DLP 3D printing (i.e. vat photopolymerization process – ASTM F2792 − 12a) for some time, we had chosen to stay away mostly due to resin issues. Over the past few years, many new resin formulations have become available and many are both low in odor with toxicity within reasonable limits (in fact several resin systems are open sourced). When you combine the improved resin systems with substantial activity in crowd funding sites and IRC chat, we decided to jump in to see what all the flashing lights were about. 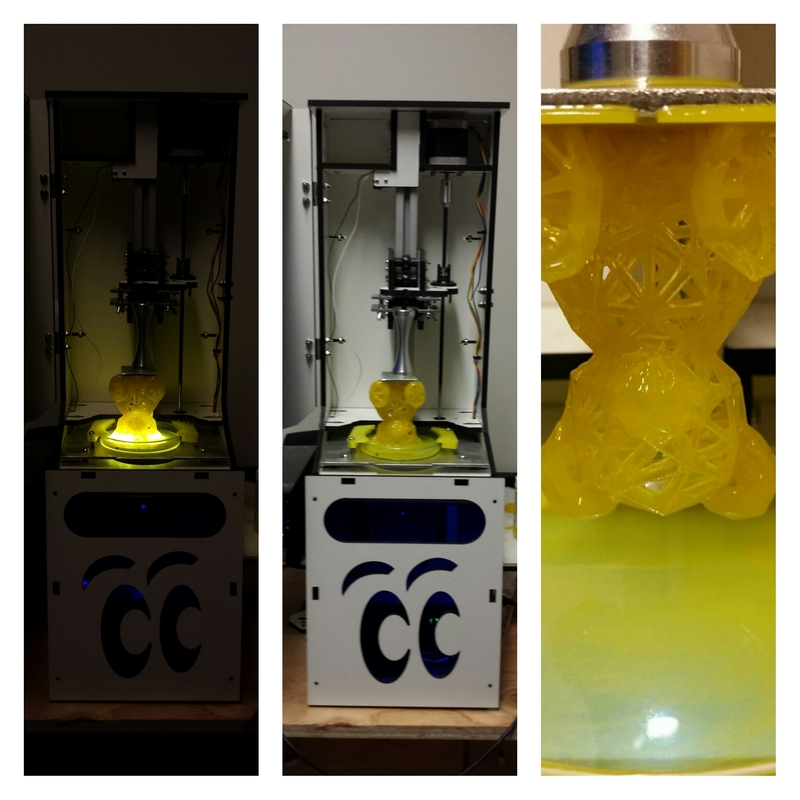 We purchased a couple of systems and have been exploring both overall print system and resin concepts. The left image is the exposure phase (about 1 sec). The middle image during the peel and re-position phase (about 1 sec). The right image is a completed tet-ty. It’s exciting to see the speed and quality of this process – no wonder everyone is excited. I remember you being very concerned over the resin compositions a couple of years ago – mind sharing which ones you are using with the Droplit printer that you are more comfortable with? Corwin, we are happy with the Makejuice product line. We have been exploring a few other resins. Also, AutoDesk just open sourced their resin (always a good thing). Did you see that AutoDesk started the process to opensource their Spark Ember.